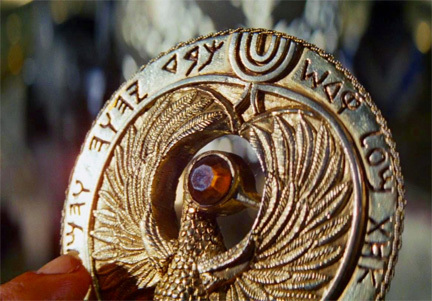 The Headpiece to the Staff of Ra was a much sought-after medallion which was originally designed as a means to reveal the location of the Ark of the Covenant. The headpiece was designed to be placed atop the Staff of Ra and used in the Map Room at Tanis to reveal the location of the Well of the Souls, the resting place of the Ark. The actual Staff of Ra, in and of itself just a simple a shaft of wood, was apparently long lost to history, but the headpiece contained instructions on how high to make a substitute staff. The instructions written on the headpiece stated that the staff should be six kadams high. However, the other side of the headpiece held specific instructions to take back one kadam to honor the Hebrew God. Behind the scenes : The headpiece prop was created for the Raiders art department by sculptor and miniaturist Barry Minot. Despite being implied in the movie to be Egyptian, the writing around the edges appears to actually be Hebrew block letters. However, upon closer inspection, the script is actually revealed to be the Phoenician alphabet, the first widely used non-cuneiform Semitic abjad.